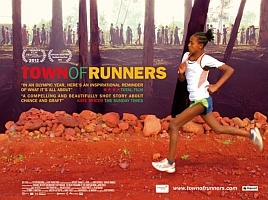 A timely release in this an Olympic year, British director Jerry Rothwell follows up his award-winning 2010 film Donor Unknown with Town of Runners (2012), a well-intentioned documentary that follows the trials and tribulations of two young Ethiopian athletes as they strive to climb the ranks of the country’s long distance runner roster. The film revolves around the small rural town of Benkoj, home to Olympic and World champions Tirunesh Dibaba and Kenenisa Bekele, which has produced two fresh, potential rising stars in the form of 14-year-old Hawii and her slightly older friend Alemi. Both girls harbour dreams of emulating their sporting idols, yet the path to success is littered with pitfalls, from bankrupt sport clubs to career-threatening losses of form. Also featured is the doc’s on/off narrator Biruk, a young boy who looks after his grandmother’s shop in between his studies and training. On the face of it, Rothwell seems to have struck documentary gold with Town of Runners. If Hugh Hudson was capable of making a bunch of privileged public school boys doing a few laps around Cambridge compelling in 1981 Oscar-winner Chariots of Fire, the prospect of two humble teens escaping their pastoral shackles through sporting excellence has all the hallmarks of a solid crowd-pleaser. Yet somewhere along the way Rothwell stumbles, presenting a slightly too-contrived version of events that only fleetingly lifts the veil on the mistreatment and mismanagement certain unlucky runners are forced to endure. The initially chirpy Hawii is the life and soul of the film, a plucky young pretender with a near inexhaustible supply of self-belief. Yet far too little time is devoted to the abysmal living conditions and lack of care she experiences at the hands of an extremely poorly-run sports club. Her ever-jovial Benkoj coach and mentor Sentayehu Eshetu also gets off extremely lightly, perhaps due to his willingness to play up to Rothwell’s roving cameras – are we really expected to believe that this is the first that Benkoj has heard of his former students being mistreated? Whilst the director should be commended for trying to put a positive spin on an African story (we’ve certainly had enough doom and gloom over the last few years to put people of exploring the continent for life), the scale seems to have been tipped ever-so-slightly into the realms of over-optimism. Rothwell has yet again picked out an extremely relevant and topical subject with which to engage, and whilst flawed, Town of Runners remains a worthwhile watch for those interested in athletics, Africa or simply the sheer unwavering endurance of human ambition.